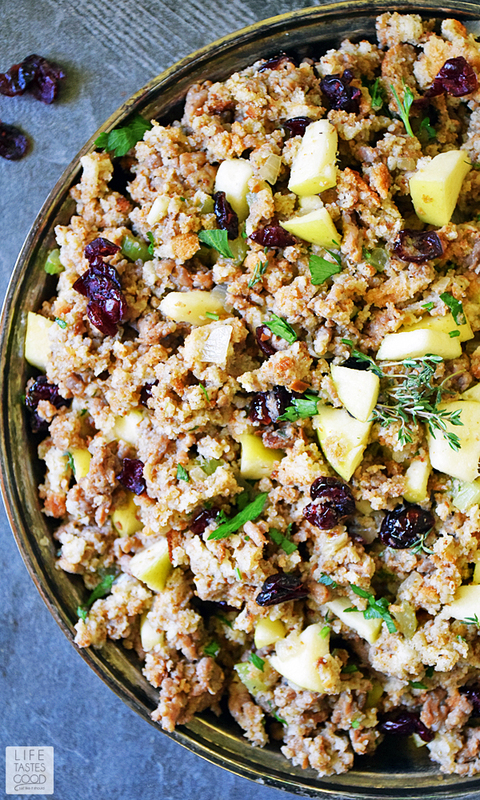 Sausage, Apple, and Cranberry Stuffing is a Thanksgiving tradition in our home. Full of fresh ingredients to maximize flavor, this stuffing recipe is sure to become your favorite Thanksgiving side dish! Bonus - it's pretty easy to make and can be prepared in advance! The #SundaySupper Tastemakers are preparing for the holidays! We've been busy in the kitchen testing our favorite Thanksgiving recipes. This week we are sharing our favorite holiday side dishes, but stay tuned in the coming weeks for our favorite holiday dessert recipes and even a Sunday devoted to using up those inevitable leftovers in the tastiest ways! Whether you are hosting a large family Thanksgiving dinner or just taking a potluck dish to share, there is something for everyone. 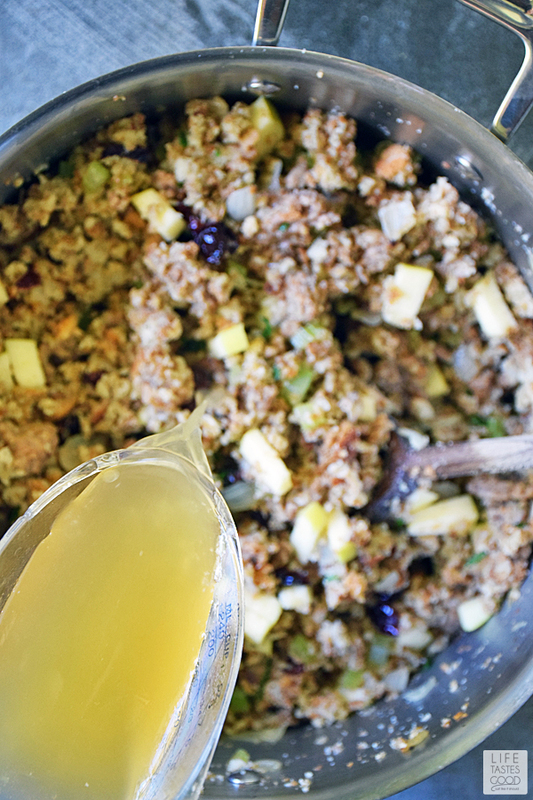 As I mentioned above, this is our family favorite when it comes to stuffing, or dressing, whatever you call it, I need to make a big heaping bowlful every year for Thanksgiving. 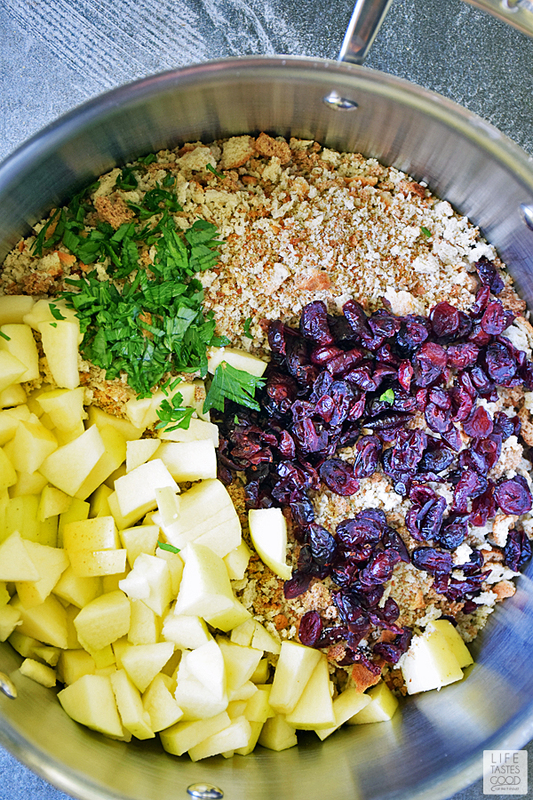 The cranberries, apples, and sausage work in perfect harmony to create spoonful after spoonful of sweet, savory, and delicious magic! This stuffing has become pretty sacred in our house. It's not Thanksgiving without it, and I don't seem to make it any other time of year. It's just always been a Thanksgiving thing. We all look forward to this special treat every November! We are serious about our stuffing! I think it's important to keep some things special. You know what they say about too much of a good thing... it's true! I love family traditions! Share your favorite Thanksgiving food traditions with me in the comments below. 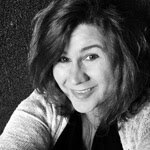 I'm always looking for new and tasty ideas! Make the stuffing ahead of time. I usually make it early in the day on Thanksgiving, but you can make it a day or two ahead. It reheats nicely in the oven while the turkey is resting. I prefer to use 6 cups of bread cubes. I usually purchase a baguette a day or two before when I do my Thanksgiving shopping and then cube it up the morning of Thanksgiving when I'm making the stuffing. However, I have been known to cheat from time to time (shhhhh - don't rat me out haha) and buy a 14 ounce bag of stuffing bread. Either way, this stuffing is delicious, so if you are feeling overwhelmed and just can't imagine doing one more thing, skip the cubing and toasting of the bread to save yourself some stress and buy a bag of stuffing bread. 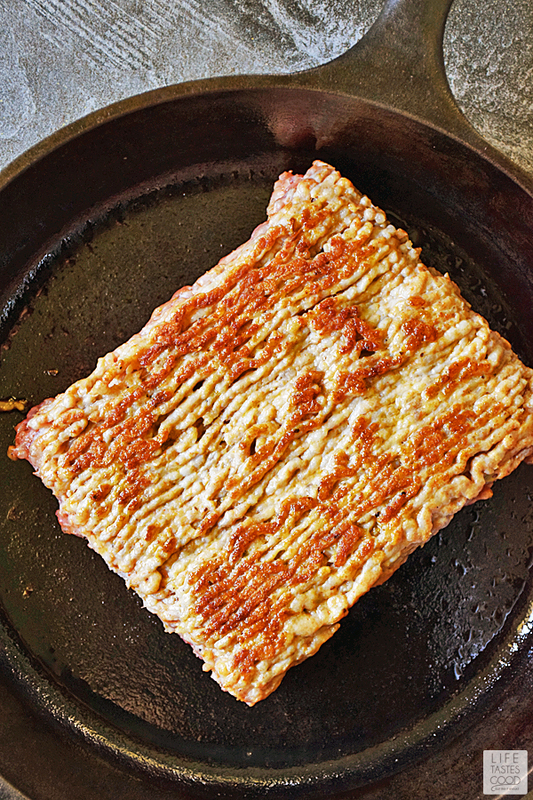 Sear the sausage by placing the slab in the hot skillet all in one piece (refer to step-by-step photos below). This will get a good sear on one side before breaking it up into small pieces. Searing the meat adds loads of flavor. Don't salt the sausage...yet! Sausage, typically, is highly seasoned so I wait until the sausage and veggies are cooked and give it a taste. I add salt if needed, but it rarely is. Add in as much or as little broth as you like. Everyone is different when it comes to stuffing. Some like it dry and others like it pretty mushy. I typically use 2 cups, but I recommend starting with 1 cup and adding in 1/2 cup at a time until it is the consistency you like. Add more as needed when you go to heat it up for serving. 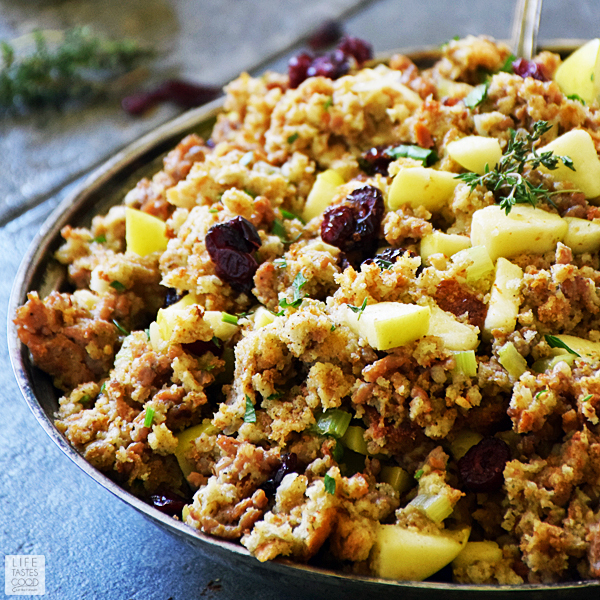 Sausage, Apple, and Cranberry Stuffing is a Thanksgiving tradition in our home. Full of fresh ingredients to maximize flavor, this stuffing recipe is sure to become your favorite Thanksgiving side dish! Line a large baking sheet with parchment paper and spread 6 cups cubed bread in a single layer. Bake in preheated oven until evenly toasted - about 5-7 minutes. Toss the toasted bread crumbs into an oven safe bowl. In a large skillet over mid-high heat, sear 1 lb sausage for about 3-4 minutes until the one side is nicely seared. 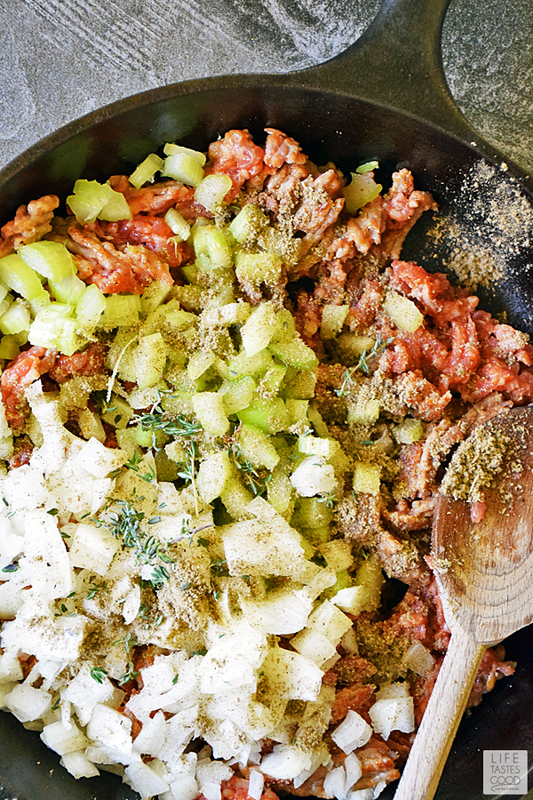 Turn over and add 1 cup diced onions, 3/4 cup diced celery, 2.5 teaspoons dried sage, and a 1/2 tablespoon fresh thyme. Stir to break up sausage and combine with vegetables and seasonings and continue to cook until sausage is cooked all the way through and no longer pink. About 5-10 more minutes. When the sausage is cooked through, add the sausage mixture to the bowl with the bread crumbs and stir to combine all the ingredients. Pour in 1-2 cups turkey stock and stir to combine. Add more turkey stock if you like. I recommend adding 1 cup, stir, and then add 1/2 cup at a time until you reach the consistency you like. Stir each time after adding stock. Give it a taste and adjust the seasonings to your liking. Refrigerate until ready to heat and serve. I typically make this up in the morning, and put in the oven to heat through while the turkey is resting. You can also make this up a day ahead if you prefer. I don't stuff my turkey, because, generally, you have to cook it so much longer to ensure the stuffing is safe to eat that you end up overcooking the turkey. 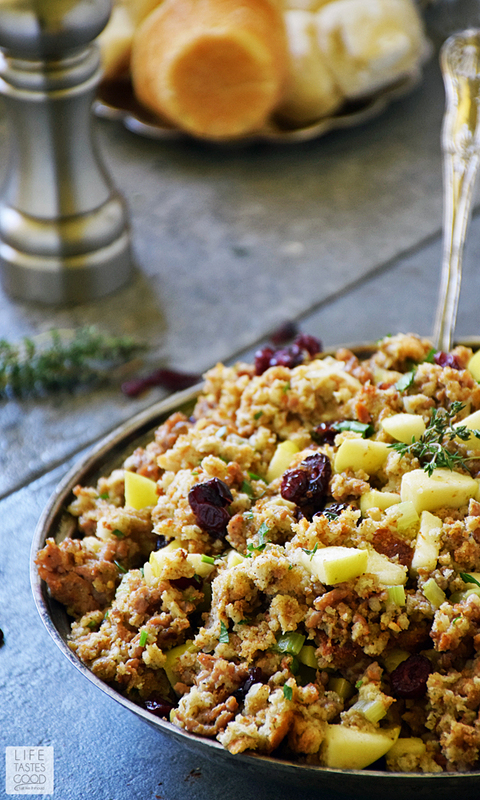 Cooked in the turkey or out, this stuffing is always a winner! Enjoy! To reheat: Cover with foil and cook in 350°F. preheated oven for about 20-30 minutes until heated through to your liking. Serve and enjoy! There are so many recipes for stuffing, but this looks like a perfect one full of great Thanksgiving flavors!